Should the City Loop reverse at lunchtime? It’s taken me longer than I thought to get this post to something approximating shipshape. I’m not sure it’s perfect yet. Reminder: the views expressed on my personal blog do not necessarily represent the views of the PTUA. Following on from previous posts about the Loop, the next question is: Should the City Loop reverse directions at lunchtime? 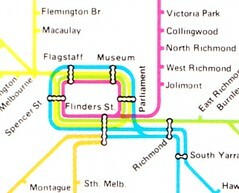 The Loop was built to solve the problems of pedestrian crowding at Flinders Street, and to avoid having trains reverse at busy platforms in the City. They can’t all run as cross-city services, as there has traditionally been an imbalance in the number of suburbs, and trains, between the east and west. The Loop was built to be bi-directional. At some stage during the design process, someone decided that Loop trains should stop at the underground stations first in the morning on the way into the City, and last in the afternoon on the way out. On each of the four loop lines signalling will be designed for trains to run in one direction in the morning peak and for most of the day. The direction of running will be reversed for the evening peak. In the context of the original infrastructure and operating plan — with for instance trains from the east in the morning running around the Loop then into massive stabling areas just east of Flinders Street, and back the other way in the afternoon — this made sense. But this doesn’t generally happen anymore — most of the stabling is now in the suburbs (though there is still some around North Melbourne), so it largely doesn’t matter which direction each Loop tunnel runs. It’s limiting. You can’t get from the underground stations to Flinders Street and Southern Cross after 1pm on weekdays, for instance. It results in long gaps between trains during the changeover. In the Burnley tunnel the last train inbound via Parliament is at 12:45pm. The next one (outbound) isn’t until 1:13pm. This limits the Loop’s usefulness just at the time when many are packing onto trams for intra-CBD travel at lunchtime. It’s unfair to peak hour commuters going to particular stations, for instance Sydenham line to Southern Cross people, who either change trains or have a long trip right around the Loop, in both morning and evening peak. Running whole lines via the Loop means you are likely to have large numbers of people getting off trains at North Melbourne and Richmond and wanting to get into the Loop in morning peak, and out again in the afternoon. Without the reversal, you may not serve them very well… they may have to instead change at Southern Cross or Flinders Street, making for a longer trip. With the reversal, peak hour commuters can follow the same route home as they took in, so for some people it is easier to remember. In 2008 the Clifton Hill loop began running clockwise all day on weekdays. This was to avoid a bottleneck near Jolimont. It meant for the first time that it was possible to get from Flinders Street and Southern Cross to the underground stations in the morning. It’s not perfect. There are often delays at Flinders Street before the train proceeds around the Loop. In some cases trains go out of service at Flinders Street — because a minor fault (one that can wait until the end of a run) has been found, and the run ends at Flinders Street. These problems could probably be resolved with changes to work practices. Even if the train runs as timetabled, Jolimont to Parliament (via Flinders Street) now takes up to 14 minutes in peak (including sitting at Flinders Street for 2 minutes), against around 3 minutes direct. Oddly at weekends, the Clifton Hill loop reverses, running anti-clockwise. Apparently this is to ensure the drivers remain qualified to run trains that way, and it ensure the outbound track from Flinders Street to Jolimont remains in use (it can become problematic otherwise). Are these good enough reasons to reverse the pattern and confuse everybody? I’m not convinced. Let’s say two tunnels ran clockwise, two anti-clockwise, and some lines ran via the Loop, some direct. Hurstbridge and Epping: run clockwise around the Loop. It should be clockwise to avoid the bottleneck junction at Jolimont. They should all run via the Loop because they share tracks from Clifton Hill inwards anyway. Craigieburn, Upfield and Sydenham: let’s suppose these run anti-clockwise. While running them clockwise would be good to avoid a minor clash with Seymour trains, it would also overload them at North Melbourne with Williamstown/Werribee people wanting the Loop. Now how about if we run Cranbourne/Pakenham clockwise around the Loop. To balance it out, Belgrave/Lilydale/Ringwood/Blackburn trains would run anti-clockwise. 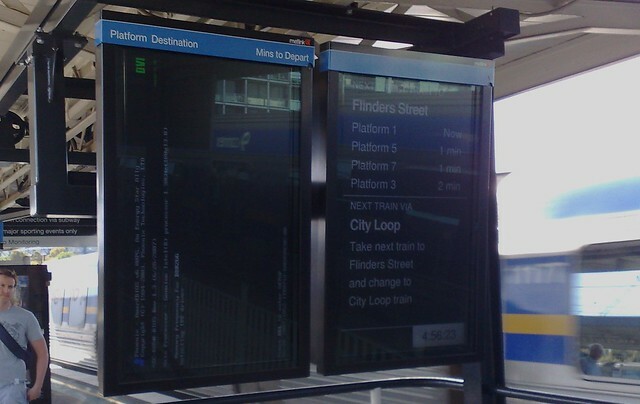 To make it work properly, there would need to be no delays at Flinders Street. Stop, passengers off, passengers on, leave straight away. It needs to be just another station along the line. Done properly, this would involve moving driver shift-changes to somewhere else; probably at the ends of lines. How would that work for passengers? I’ve tried to work it all out in a table. Skip this bit if this kind of detail is likely to put you to sleep. Note: Approximate current CBD usage is: Flinders Street 37%, Melbourne Central 22%, Parliament 17%, Southern Cross 16%, Flagstaff 8%. *The asterisks highlight the optional changes that people might make if they were in a hurry. The issue is that if too many of them change, it’s likely to create crowding at interchange stations, and on other trains. Would they bother? I don’t know. It might not be worth the bother for most people. For someone arriving on a clockwise Loop train going to Parliament, if changing trains involves a wait of 0-4 minutes for a connection, to save perhaps 7 minutes, they might just stay on the train. In an ideal world, I think you would go for each loop tunnel running in a consistent direction. Have some clockwise, some anti-clockwise, and ensure that you could get from any CBD station to any other, at any time of day, preferably with a combination that allows a backup if one loop tunnel is disrupted. It’s got a lot of benefits. And you’d ensure trains travelled straight through Flinders Street with the quickest stop possible. But it’s not an ideal world. The prospect of some lines running direct (the majority, at least on this blog, seem to support it, and it’s starting to happen anyway), means that large numbers of passengers may want to change trains and travel between Richmond and Parliament/Melbourne Central, as well as North Melbourne and Flagstaff (eg trips which are considerably longer by going the long way around). Because the Burnley and Caulfield Loops both go through Richmond, if they ran in different directions, I suspect you’d be almost bound to get lots and lots of people in the morning changing onto whichever one went anticlockwise to Parliament. It would be fascinating to see some detailed analysis on it. Ideally I think the Northerns should go clockwise, that way those with the inclination can change at Nth Melb and those without it can stay on the train and take the longer trip (so there’s trains goign both ways inwards from both N.Melb and Richmond and people have the choice); it also resolves the ‘can’t get there from here’ problem if you want to go from Parliament to FSS as only the Northerns running clockwise can provide that link. I think no, it should stay as it is planned to be from May. Make Northern and Caulfield trains go direct to Flinders Street first then via City Loop adds travel time like the current Clifton Hill services and long waits at Flinders Street Station. On weekends, the Clifton Hill and Caulfield group trains go through the City Loop to Flinders Street first then direct. The system for weekends should remain the same as well as if all trains doesn’t go through the City Loop to Flinders Street first, there would be no direct services at all! I am not sure, but I would like some predictable consistency that is easy to remember. Maybe I am just born lucky, but trains always go around the loop when I don’t want to. Has there been any thought given to having two tunnels dedicated to constantly circling trains, say at 2 minute intervals, one in each direction? This is like shuffling the deck chairs on a rather full sinking ship. It’s been 40 years since the loop was constructed when Melbourne’s population was 2.3 million, compared to 3.2 million (ish) today. Why not fix the problem properly and build the bi-directional tunnels? This would mean another 4 tunnels, but would bring us into line with most cities that have an underground service. Better value than building the Geelong bypass along an entirely different route that gives us few new services and no additional speed benefit. And that’s as someone who regularly has to put up with the crappy Geelong line services. Either fix it properly, or don’t do it at all. @Vaughan, in the previous blog posts, some commenters reckoned run trains at one level in the same direction, so for travelling along common sections you could catch whatever came first (particularly at Melbourne Central). True Northern clockwise would provide a direct link from Par to FSS, but then, anti-clockwise is the only way of providing direct FSS to Par. As for the choice from North Melbourne, you’re never going to get that both inbound and outbound if it runs in a consistent direction. @Jeremy, all this is predicated on removing Flinders St delays. It’s essential. @Boyd, there’s only one tunnel providing a full circle, so you would need to spend a bunch of money creating another link. Secondly, given trams provide intra-CBD links (and Melbourne’s CBD is not as big as London’s, for instance), is it a priority, as it would force two groups of lines out of the Loop, and take up valuable platform space at Southern Cross and Flinders Street? @Andrew van der Stock, but what problem are you trying to solve? If you can fit perhaps 50% more trains onto the existing CBD rail infrastructure (which should more than cover the demand for travel into the CBD for now — remembering that the vast majority of Melburnians don’t travel into the CBD), then why would you spend the billions of dollars to build more tunnels, when there are countless suburbs in Melbourne that have no usable PT at all? “The Coalition has also committed to a series of pre-election promises including major road improvements to Stud Rd and High Street Rd as well as rail grade separations in Bayswater. The hated Stud Rd bus lane will be removed, while the proposal to introduce them on Wellington Rd will not happen. Several Rowville residents voting at Karoo Primary School said the thought of bus lanes on Wellington Rd had made their decision to vote Liberal a lot easier. “We are going to get rid of that ridiculous bus lane,” [Scoresby MP and current Treasurer] Mr Wells said. Sometimes it can be worth investing in a strength rather than a weakness to show the ‘best case’… rather than put in some compromised PT that just doesn’t cut it. Worry about those suburbs which don’t even seem to want PT at a later date (while ensuring you don’t preclude later PT service) so that if they change their mind it can be retrofitted. In the meantime, invest where it’s used and has the greatest potential to be used. Surely the first priority must be to upgrade the signalling system in the loop to allow the trains to run closer together, as per the london underground. A lot of the problems would disappear if this was done, in combination with removing the timing stop at FSS. All the above suggestions appear to assume that the current 2 minute gap must remain in the future. I think the unidirectional loop operation hinges on the Flinders Street issue you highlighted – Currently I would avoid staying on a train at Flinders street as you sit there like the proverbial stale bottle like a ‘time stop’ on a bus route. If it went through like other stations it wouldn’t really matter what direction you’d go through. That’d be someone who works at Parliament, maybe ? The other issue with Flinders St is that trains frequently change destination there. I sometimes get a Craigieburn Train at Southern Cross only to find a few stations later that I’m passing through Macaulay on my way to Upfield. Then only the only time I really wanted to go to Upfield, it turned into a Craigeburn train.!!!!!!! In such cases there are no announcements on the train and it is not possible to hear platform announcements while on the train. No delays at Flinders Street – now that is the biggest assumption I’ve heard in a long time!! Also what would happen to all those theories about the distortion of time in the Loop that used to get run in the letters page of the Age (before it went downhill)? In regards to the delays at Flinders Street, that isn’t as much of an issue if each Loop track is given two platforms there, but one at each of the others. That way, train A arrives, Train B arrives simultaneous with Train A departing, Train C arrives simultaneous with Train B departing, etc. Incidentally, delays at Flinders Street are almost always the fault of the passengers, as a direct result of bad train design. Switching drivers over takes no more than 30 seconds, or maybe a minute at a stretch. The rest of the time is taken up by late-running allowance (which you don’t really *need* if all trains run on the same route with no conflicts), plus the time taken loading and unloading passengers. This takes a lot longer in the modern era because a six-car Siemens train (1586 passengers crush : 12 doors) loads/unloads much slower than an eight-car Tait train (1496 passengers crush : 68 doors). The Siemens having wider doors makes little difference, this extra capacity being consumed by the higher total passengers, the extra time the doors take to open, and the fact that doors can’t be opened until the train is stopped, and the train can’t move until up to six seconds after they’re locked. All that eats severely into the mythical 20-second dwell time. @Paul, in regards to trains changing destinations, if Metrol were re-worked so that Middle Brighton and Malvern (1/2) through to Spotswood were on a separate panel from that controlling Tottenham, North Melbourne Junction and Moreland to the Northern Loop, and Malvern (3/4) around the Caulfield Loop, then it would be easier for the five Metrol Operators to make decisions about trains’ destinations earlier – perhaps even before arrivals at North Melbourne, Jolimont and Richmond. That would be the best place to change their Destination Boards in my opinion – limiting variables makes choices faster and easier. @Alasdair, yes, upgrading the Loop signalling would be nice, but it’s already at the maximum Melbourne standard so upgrading further, while technically easy, would mean swimming through about 15 years of red tape. That aside, it doesn’t help the fact that mixing trains from different locations per current causes hell at all junctions. Say a Glen Waverly train is timetabled to run to Flinders Street Platform 1, then reverse and head to Epping sidings. Now say that train is late, and it delays a train from Jolimont to Flinders Street by one minute, so when that train runs to Hurstbridge it misses the path at Clifton Hill Junction (+2min), then misses the path at Heidelberg (+3min), and at Greensborough (+8min). You end up with a train running nearly 15 minutes late, and delaying the return service to Melbourne. @Andrew van der Stock, tunnels are often claimed to be the easy way out. But think what we could buy instead of drilling more tunnels for little to no benefit? Oh, and off-topic but I’m going to comment anyway, the RRL is *neccesary* because, like everything else being done, it separates fast trains from slow trains and increases reliabiltiy dramatically. Sure, the timetables might show a longer run time, but the increase in frequency and reliability will reduce real travel time. (Finally!) moving to Loop directions, it is absolutely necessary that all four tracks reverse at some point. That’s just something that needs to be accepted, so it probably makes the most sense to reverse them on a Weekends/Weekdays basis, rather than something seemingly arbitrary. Lilydale/Belgrave: no limitations on direction, more the ratio of direct to loop trains thanks to Burnley’s design. To delve further into the details, the primary issue with Epping/Hurstbridge is that there isn’t room at Jolimont to move the portal so that services can run in both directions without having to wait for each other. This is, effectively, something we will have to deal with forever. At Burnley, affecting Glen Waverley, Alamein, Blackburn, Lilydale and Belgrave services, the issue is either congestion on Platform 4 (necessary for access to both the third track to Camberwell, and for direct services from Flinders Street), or the fact that Glen Waverley can’t run via the Loop without affecting all city-bound trains from Camberwell. The easiest infrastructure solution is an extra crossover allowing Burnley Platform 3 to Hawthorn Platform 3; otherwise the only options available are the Alamein/Glen Waverley switcheroo that will take place from May 8th onwards, or to run everything except Lilydale and Belgrave direct which creates either severe platform capacity shortages at Flinders Street, or severe congestion issues at Richmond Junction. The Southern Cross conflict issue, affecting Upfield, Sydenham and Craigieburn services (but not Newport after RRL is finished) will eventually be solved by converting all trains north of Craigieburn to Standard Gauge; this demonstrates a positive example of Salami Tactics. Finally, the Pakenham/Cranbourne issue is best fixed by changing the entire basis of trains running on the Caulfield Group; rather than splitting by Frankston and Dandenong, split by Local and Express trains using the north and south pair of tracks respectively, with flyovers at Caulfield and four tracks extended at least to Westall and Cheltenham (in the short term, Oakleigh and Moorabbin, in the long term Dandenong and Frankston) and simply mixing the express V/Line trains with the express Electric trains. So if we’re going for 50/50, with a mixture at Richmond, we end up with Caulfield and Clifton Hill clockwise (plats 1/2 in the Loop) and Burnley and Northern anticlockwise (plats 3/4 in the Loop). Electronic signage could point this out at Melbourne Central and Parliament, and fixed signage at Flagstaff (cheaper, and nobody’ll see it on weekends anyway). But let’s say that we want to look longer-term. Let’s say we throw in a few extra crossovers at Richmond Junction and Flinders Street, to allow Richmond 7/10 Flinders Street 6/7, 5/6 8/9 and 3/4 10/11/12, each without conflicting a train on one of the other two series, and of particular note allowing a train from Flinders Street 10 to get to Richmond 4 without passing through Flinders Street 12. I’m also assuming that Platform 11 is preferable to 13 from a passenger perspective, infrastructure gains aside. That of course leaves Sandringham unaccounted for, so let’s take that one and close Windsor – Richmond along with Jewell – North Melbourne on the Upfield Line, then link the two with a tunnel under Swanston Street. (Again, this is very long term, making tunnels on different routes to the Loop acceptable.) That leaves Sunbury and Craigieburn in the Northern Loop, although if you feel inclined you could change that to Melton and Sunbury, with Craigieburn running to Frankston, Dandenong to Newport and Traralgon/Bairnsdale to Flinders Street 12.